Coconut and Almond oils are the craze for skincare! If you are like me and my friends who love to wear shorts and skirts all summer long – You can definitely use these tips to get your legs summer ready. Everywhere you look from the supermarket to the cafes, you cannot avoid coconuts. Coconut water, coconut oil and coconut everything. I am nuts about coconut too and have seen huge health benefits from including coconut oil in my diet, skincare and beauty routines. Here are 3 steps to help you have awesome summer ready legs with! Step 3. Slather C.booth 4-in-1 Multi Action coconut fig body lotion all over your legs! Enjoy your smooth legs with a perfect coconut margarita! I got 10 Tide Pods to try out this week and the fresh scent has me sniffing all my clothes over and lover! It is easy to use with perfect proportions with no mess, no dripping, no measuring! All you do is throw the clothes in and then the pod. Easy peezy! I could not believe my luck today! After discovering the existence of mini kiwis one day a few month ago, I went on a rampant search for them everywhere. I emailed several friends and even stalked all the supermarkets in my area. Today, I found them at my local fruit bodega Mr Melon! They are virtually hairless and for $3.99 I got 8 of these bad boys. So sweet and delicious! I bit into one to show you guys I was way too curious yum yum! Perfectly paired with organic strawberries I got for $1.50 (!!) What a delightful afternoon snack. If you love strawberry kiwi Snapple – I can promise you this is 100x better for you! These super fruit mini kiwis and strawberries are packed with Vitamin C and A. Here are some of my favourite pieces! Congratulations on a beautiful collection! It’s Toronto and Tokyo Fashion Week right now and fashion is on everyone’s mind. Here are three easy ways to update your pet’s wardrobe before the Spring Equinox in a few days. Givebones has the most adorable and colorful collars for a good cause and a good price. National charitable pet company Givebones helps decrease the number of homeless and euthanized pets in the United States each year. Purchasing just ONE Givebones collar saves THREE dogs by keeping them warm and fed in a shelter for one extra day, rescuing them from euthanization. Givebones gives back 10 percent of sales to shelters and rescue groups across the country. They come in 4 sizes XS, S, M, L and in 6 fun colors. This is my favorite! The Funny Bones Turquoise. It is sturdy, comfy, and stylish! Dogs like to drink cool to cold water. Once water sits out all day, it gets lukewarm and your dog won’t want to drink it. This is a handy bowl that you can start using in spring all the way through the dog days of summer to keep your pup hydrated and cool. It is made of high-quality, heavy-gauge stainless-steel bowl with freezable, nontoxic core provides icy cold refreshment for 8 to 12 hours, even on the hottest days. Plate rim can be filled with water to form an ant barrier too! The bowl can also be used for food. Both plate and bowl have nonskid bottoms. Dishwasher-safe, awesome! Why not get a custom piece of art work for your dog and you to enjoy? 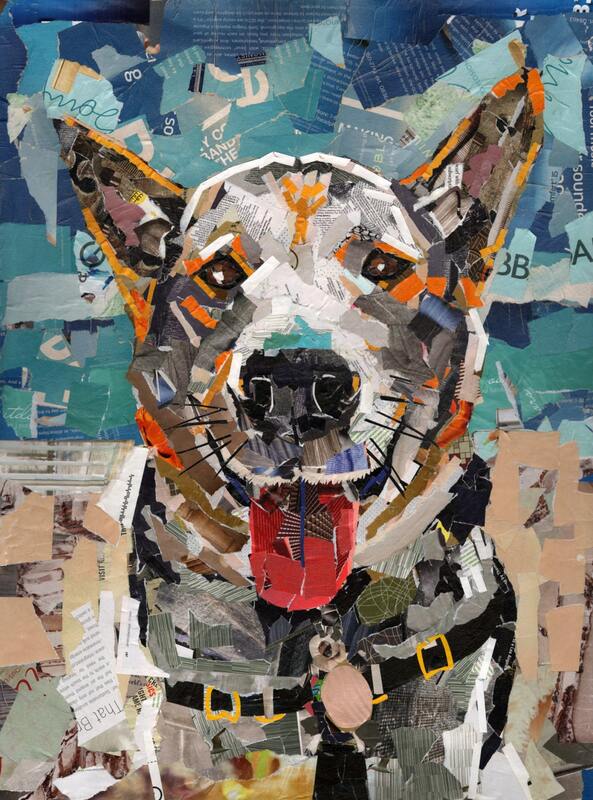 There are numerous Etsy artists can whip up a really cool collage that looks just like your pup. With all your spring cleaning, throw out the old junk you don’t need and add a piece of art!